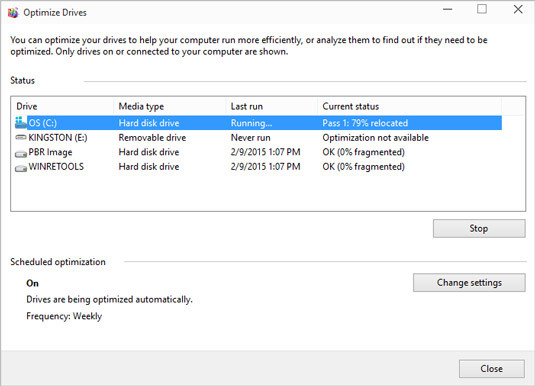 To keep your Windows 10 laptop running at its best, you may want to consider optimizing the hard drive. You can do this in just a few simple steps. To clean up files on your hard drive, enter Optimize a Drive in Cortana’s search field and then press Enter. In the resulting Optimize Drives window, to the left of the Optimize button is the Analyze button. Choose a disk and then click the Analyze button to check whether the disk requires defragmenting. When the analysis is complete, click the Optimize button. A notation appears showing the progress of optimizing your drive. 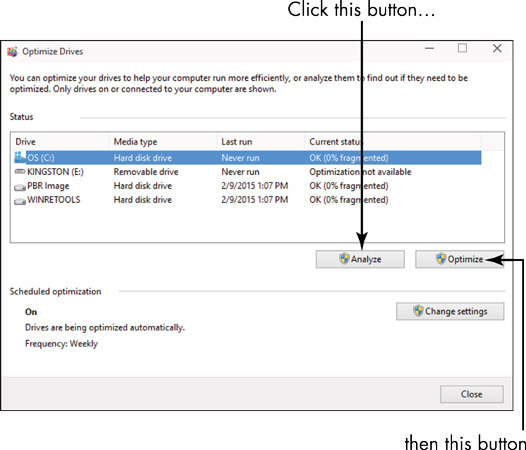 When the optimizing process is complete, the Optimize Drives window shows that your drive no longer requires optimizing. Click Close to close the window. Disk optimizing can take a while. If you have energy-saving features active (such as a screen saver), they can cause the optimize feature to stop and start all over again. Try running your optimization overnight while you’re happily dreaming of much more interesting things. You can also set up the procedure to run automatically at a preset period of time — such as once every two weeks — by using the Change Settings button in the Optimize Drives window and choosing a frequency in the dialog box that appears.